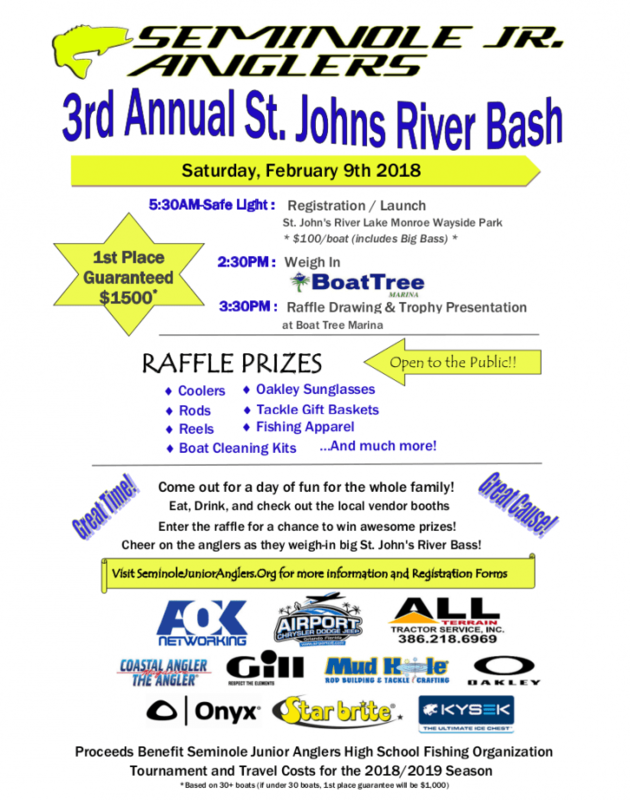 Saturday February 9 – 3rd Annual Seminole Junior Anglers St. John’s River Bass Bash. This is an open bass tournament with proceeds going to fund the high school anglers that qualify to fish the National High School Bass Tournament in Alabama. $100 entry fee for 2 angler team, includes Big-Bass award and a Captains bags of goodies and shirts for each angler. Guaranteed $1500 bucks for the winners. Registration begins at 5:30 am at Wayside Park, under the I-4 bridge on Lake Monroe and the St John’s River. Lots of raffle items and fun. The weigh-in will hosted at 2:30 pm at Boat Tree Marina at 4370 Carraway Place at the Port of Sanford. Come out a see the best anglers in our area bring the fish to the scales and help support our future generation of Bass Anglers and raise some money to send them to Nationals! Visit seminolejranglers.org for more info and registration forms.